Settlement Only The First Step In BP's Legal Woes After a deal was announced late Friday, a federal judge in New Orleans postponed a trial set for next week. The proposed settlement covers only private plaintiffs; BP still faces lawsuits from other companies involved in the disaster, and from the federal and state governments. 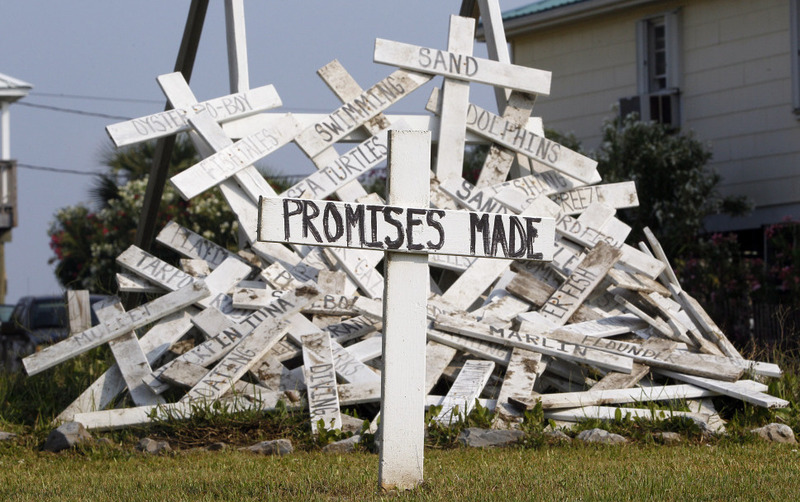 A cross with the words "Promises Made"-- referring to statements from BP and government officials — stands in front of a pile of crosses symbolizing things that were impacted by the spill, in a front yard in Grand Isle, La. Oil giant BP has agreed to settle thousands of lawsuits stemming from its well blowout in the Gulf of Mexico. The deal was announced late Friday and prompted a federal judge in New Orleans to postpone a Monday trial, but the proposed settlement solves only one piece of BP's legal exposure from the worst environmental disaster in U.S. history. The settlement would cover only private plaintiffs — individuals and businesses with either economic losses or medical claims resulting from the oil spill. BP estimates it will pay out $7.8 billion to compensate oil spill victims, but there's no cap on claims. Plaintiff Chris Nelson of Bon Secour Fisheries, a seafood processor on the Alabama Gulf Coast, isn't yet sure whether the settlement will satisfy his family's claim for lost business. But he's somewhat disappointed the trial has been delayed. "I understand court cases often settle, but people deserve to know what actually happened out there," Nelson says. Though the framework of the deal between BP and what's known as the Plaintiffs Steering Committee was announced, the terms have yet to be finalized. That lack of detail is troubling for Daniel Becnel Jr., a lawyer in Reserve, La., who represents oil spill victims. "We don't know the finite amount of money that is going to go to various types of plaintiffs because no claims data has been collected," Becnel says. "We don't know exactly how long the process will take. Most of these people are going to have to start from ground zero." The settlement must be approved by the court before it is official. But the fact that the parties have an agreement is significant, says Martin Davies, director of the Maritime Law Center at Tulane University in New Orleans. "It's a big step forward to final resolution of the private claims," Davies says. "It doesn't settle everything though; it won't make the trial go away altogether — or at least not just yet." That's because BP still faces lawsuits from other companies involved in the well, and from the federal and state governments. Billions more are at stake in civil and potential criminal fines for environmental damage caused when the well blew in 2010, killing 11 rig workers and spewing some 200 million gallons of oil into the Gulf. Alabama Attorney General Luther Strange is coordinating the state claims against BP. He declines to discuss settlement negotiations, but says the states want to go to court. "We have a very strong case to make against BP and other defendants, so we look forward to trial," Strange says. "Of course if something happens on the settlement front we'll have to review that at the appropriate time." The Department of Justice says it is pleased BP may be stepping up to address harms to individuals, but says the deal by no means addresses the company's full responsibility. Nelson hopes there will ultimately be a trial. "It was pretty traumatic for everyone, certainly not to the extent for those families who lost loved ones," he Nelson, "but all of us that had suffered an impact from it, we want to achieve some kind of closure with it, and I don't think the money is what people are really looking for here."